Being an effective family caregiver means identifying the challenges and risks that your aging parent might face and understanding them in the best way possible so that you can give them the home care, support, and encouragement that they need to manage these needs. One such risk is Parkinson’s disease. • Approximately one million people throughout the United States are currently suffering from Parkinson’s disease. • This number is more than the total number of people throughout the country who are suffering from muscular dystrophy, multiple sclerosis, and Lou Gehrig’s disease combined. • An estimated 60,000 people throughout the United States are diagnosed with Parkinson’s disease each year. • It is thought that there are thousands of cases of PD that are never identified and diagnosed due to misunderstandings of the symptoms and misdiagnoses. • There are more than 10 million people throughout the world who are living with Parkinson’s disease. • The risk of developing Parkinson’s disease increases with age. • Only about four percent of those who are diagnosed with Parkinson’s disease receive this diagnosis prior to the age of 50. • Men are at one and a half times the risk of developing this condition as women. 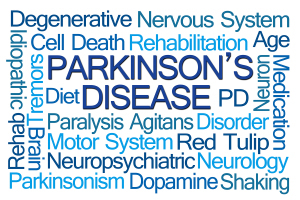 • Parkinson’s disease is a progressive disease, which means that it will worsen over time and those suffering from the condition will experience new and worsened symptoms throughout their journey with the condition. • Approximately 70 percent of those with Parkinson’s disease will develop tremors during the early stages of the disease. • Typical onset for the tremor symptoms is in one finger. • Most often, tremor symptoms occur on one side of the body and the side of the body where the initial tremor symptom occurs is where it will stay. It is important to remember that there are some signs and symptoms of Parkinson’s disease can be easily confused with other conditions. This makes it essential that you bring all new symptoms and behaviors to the attention of your loved one’s doctor so that they can be easily evaluated and your parent can receive an accurate diagnosis. As with other medical conditions, early detection is key to getting your loved one on the right course of treatment and management that is right for their needs. While there is no cure for PD, these treatments can help your parent live a higher quality of life as they progress. If your aging parent has recently been diagnosed with Parkinson’s disease, now is the time for you to consider starting elderly home care services for them. An elderly home care services provider can be with your aging parent to help them manage their individual challenges, needs, and symptoms in a way that is compassionate, supportive, and tailored to their specific personality, beliefs, and lifestyle goals. As PD is a progressive disease, you can also feel confident that this home care provider will be able to adapt their care and support as your loved one’s needs change, enabling them to consider living the highest quality of life possible as they age in place. This entry was posted in Home Care Services Cordova TN and tagged Home Care Services Cordova TN. Bookmark the permalink.